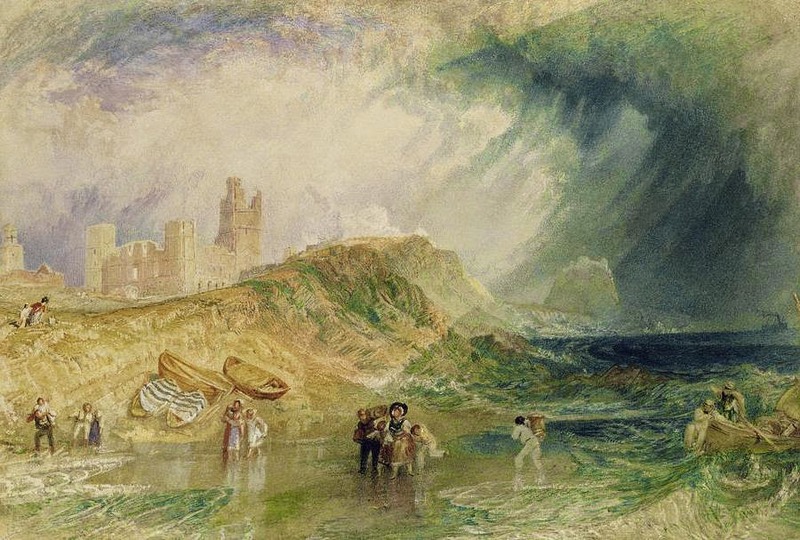 That is John Ruskin talking, and actually he would have made an exception for the picture on top, which shows The Holy Island, Lindisfarne, as seen by J. M. W. Turner around 1829 and embellished with some of his trademark atmospherics. But let us not allow such exceptions, as truth must be absolute, and anyway, it is not painting we’re interested in today. Instead let us think of field recording as the landscape art under discussion. Field recording, a genre that seems to come with an inbuilt promise of penetrating something hidden, of catching something fleeting, since we automatically enter a more reflective space through the fact that our supposedly prime sense, vision, does not drown out the acoustic experience. To merely listen seems to offer some kind of meditation on the secret nature of things…and indeed, if we follow Ruskin further, maybe his demands from the landscape artist would be best fulfilled by field recorder: “The artist has done nothing till he has concealed himself—the art is imperfect which is visible—the feelings are but feebly touched, if they permit us to reason on the methods of their excitement.” Just put up a mike and press the button. This active mode of listening characterizes Watson’s artistry, where events are often so close-miked that they penetrate to the heart of what maybe never existed, but the sounds that surround me here at my desk remain relatively distant. I’m listening to In St Cuthbert’s Time from 2013, “a 7th century soundscape of Lindisfarne,” as the booklet promises. There is of course nothing in the wind and the waves and the birdsong that would tell me it is not supposed to happen right now. Still the sounds suggest a somewhere, and I love me a conceptual conceit, so I gather what information I can from the booklet: about Lindisfarne and its history, 7th century monasteries and the writing of gospels on one hand; Latin names for the birds in order of aural appearance on the other; but not much to connect the two. 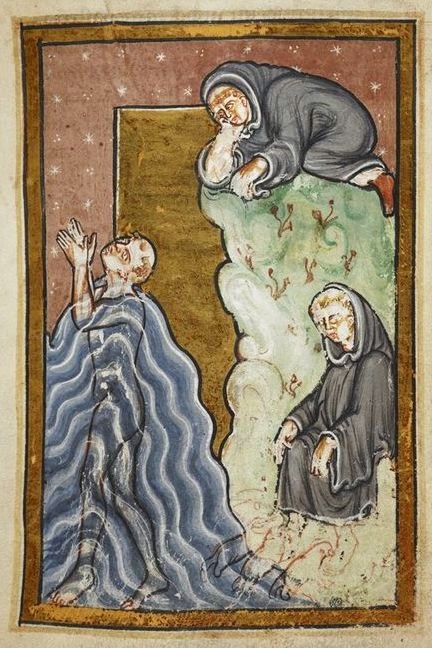 So in the 7th century, Lindisfarne, a tidal island off the eastern English coast, was a center of Christian culture, a priory of monks with a high quota of saints living the community life with mutual washing of feet, conquering of human nature, and illuminating of gospels. Watson proposes not a sound image of, but background sounds for these activities: “The production aims to reflect upon the daily and seasonal aspects of the evolving variety of ambient sounds that accompanied life and work during that period of exceptional thought and creativity.” An active selection of sounds that make up a vintage vibe sorted by seasons and cleaned of modern civilization (there’s cattle here, though, I hope of an ancient breed). And yet immediately a historical narrative begins, not in the sense of a story, but as a portrait of the possible attention these holy men might have spent on nature while they wandered alone in solitude. There is a nudge for the listener toward this historical angle, as Watson sends an actor through the aural picture ringing a monk’s handbell. Anecdotal evidence: here probably comes a fellow monk also looking for solitary space to leave the world behind in; let’s walk another way so both our meditations can go uninterrupted. It works very well, doesn’t it? 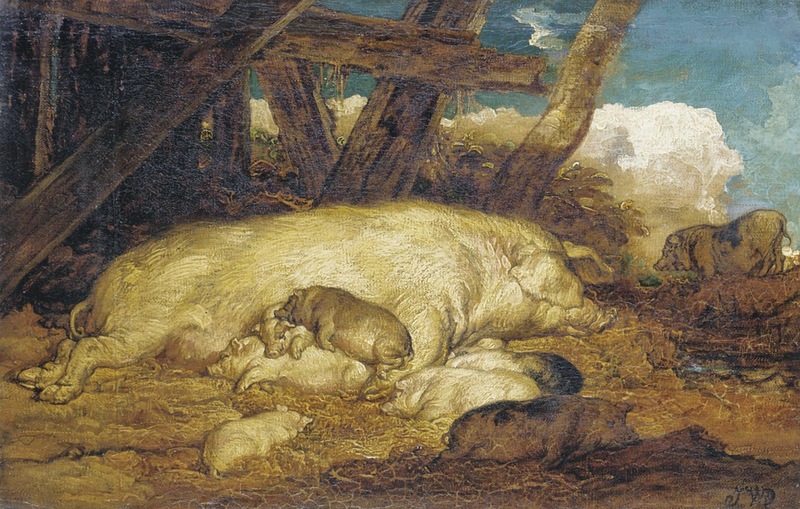 Here’s what Rossetti wrote about it: “The amount of work is very great. I suppose it is the only picture existing, of so definitely ‘historical’ a class, in which the surroundings are all real studies from nature—a great thing to have done. The sky and sea are sky and sea, and the boats are as accurate and real as if you had got such things to sit to you. The whole scene too, and the quiet way in which the incident is occurring, at once strike the spectator with the immense advantage of simple truth in historical art over the ‘monumental’ style…” It is as if he had made the same test to judge the painting, while we’re checking the usefulness of the sounds as a picture of bygone times (Zeitgemälde in the more layered German term). Sound artist/musician Patrick Farmer will have none of that. In his review of Watson’s record for The Field Reporter he insists: “This is not a case of a prerequisite willing suspension of disbelief. 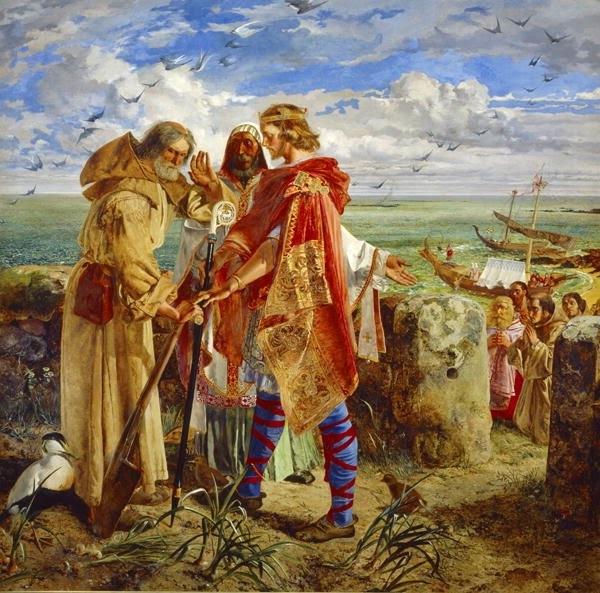 Nothing here seems to be paraded as a fiction.” Instead, Farmer attempts to take the artist by his word (or his implications), and is immediately stopped in his tracks on a technical point: “Watson states, or muses, that the sounds herein are a representation of the Holy Isle, Lindisfarne, some 1300 years ago. Unease… How is it that one can listen to this over electronic speakers, through whatever electronic device is preferred, and ultimately made, with electronic equipment, the modernist of the modern!” Farmer’s own argument places him in the classicist camp of the modernist of the modern, as he would prefer an utterly abstract purity of concept: “Each time I felt the sounds therein were better suited to an unapproachable, almost playful, sense of abstraction. When I say better suited, I mean I prefer to treat them as sounds entirely distinct from the concept upon which Watson lays them… For me this is abstract electronic music. Leading me to listen as intently as possible to this disc, as sounds, rather than as any form of nature, re-presented or re-imagined.” Unease… How is it one can listen to readily identifiable sounds that clearly speak of the wind and the waves and the birds and pretend they are abstract just because they are rendered through an electronic medium designed to transmit the signals that creative people send us to our ears? (Though actually sometimes the nature portrayed in St Cuthbert’s Time seems to aspire to the condition of abstract electronic music: birds’ song appearing almost quantized in repeated rhythm, and the winnowing of snipe like heavy tremolo effects turned up and down through a pitch-shifter (I’m sure all sounds here have natural causes, but checking the winnowing of snipe against anonymous recordings of the same on youtube, or even against the track “Sunsets” in Watson’s earlier album Stepping into the Dark, they do have incredible electrified presence here). Farmer himself made a wonderful record in duet with David Lacey called Pictures of Men in 2013, the same year as Watson’s Cuthbert. An aggressively figurative title, these pictures are not of men themselves, but maybe of their belongings, their transport and surroundings, and mostly of their abstract electronic music. It mixes sounds of decipherable origins with abstract noise and musical tones at an anecdotal pace. But some of the ingredients are the same as Watson’s, so what could better prove the difference in concept than to compare these sounds under the same conditions. What story will they yield? The stream does not do it any justice but you have an idea. It’s incredible, each little movement rounded out with loving care. It is also massive, the liner notes seem to say these must be patterns formed by swirling flocks of starlings over their roost? Anyway, here as elsewhere, the recording is quite dense, in several layers. There is no downtime, no meditation, but over the initial rumble of the sea and/or a dark wind, nicely muffled, very warm and deep, form a stage for a series of events, mostly birds that doing their thing, collective then more confident taking solos, augmenting each other, one group coming in as the other drops out, like the sections in a big band. Sometimes the listener is allowed closer, but what most strikes me is that the landscape keeps sitting in front of my speakers performing—this is no landscape to immerse oneself in. It remains resolutely an other, looking at me, waiting to be looked at. Finally, after all the creative listening, what’s with the monk’s creativity? 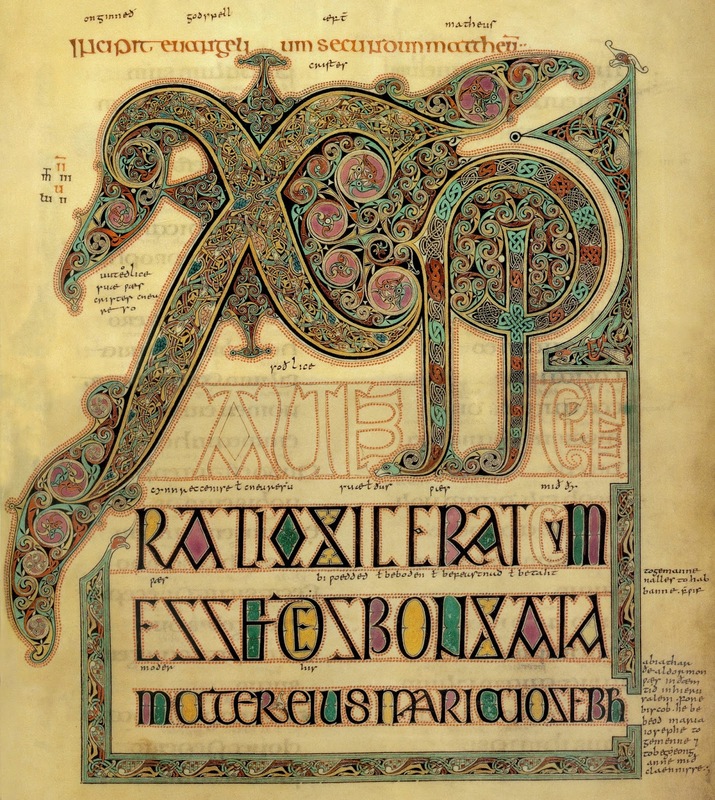 We remember, In St Cuthbert’s Time aimed to project the “ambient sounds that accompanied life and work during that period of exceptional thought and creativity.” The Lindisfarne Gospels show both the figurative and the abstract. Saint Matthew sitting in a box with a curtain like in a photo booth (with a horn-blowing angel sitting on his head). Little grotesqueries that look like bathing ducks and stuff attached to ornamental patterns. Elaborate decor in wondrously outgrown, completely non-objective initials, like this chi-rho…or wait, is it a bird?